Product prices and availability are accurate as of 2019-04-20 02:11:38 UTC and are subject to change. Any price and availability information displayed on http://www.amazon.com/ at the time of purchase will apply to the purchase of this product. We are currently offering the sought after The Retirement Life Inventory: 50 Once-a-year questions to ask yourself about your retirement for a slashed price. Don't pass it by - purchase the The Retirement Life Inventory: 50 Once-a-year questions to ask yourself about your retirement online today! 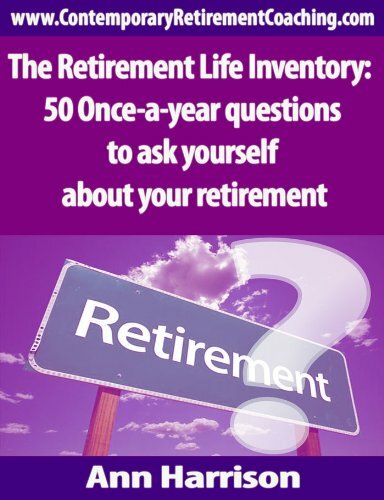 The Retirement Life Inventory is a series of 50 thought-provoking questions about the subject of retirement, compiled by Ann Harrison, a Retirement Options-trained coach, trainer and Too Young To Retire facilitator. The 50 questions cut straight to the point – straight to what matters. Their aim is to help retired people get the happiest, healthiest, most vital, productive, energetic, prosperous and fulfilling retirement they could possibly have, whilst, at the same time, helping them to balance having the kind of retirement they want and deserve to have, with planning to meet their future needs.